Author Maggie Hoffman encourages you to leave your college memories of Jäger shots at the door because this hearty Bloody Mary recipe packs a delicious punch of bittersweet flavor. Created by Patrick Gaggiano and Willy Shine, the recipe is a “bold, earthy drink that’s fantastic alongside a hearty brunch,” Hoffman writes in her new book Batched Cocktails. “You can pour little glasses of extra beer for everyone if they’re having a particularly rough morning,” she adds. Up to 2 hours before serving, make the batch. Pour chilled Jägermeister, green Tabasco, sriracha, allspice, chipotle powder, and salt into a 2-quart pitcher and stir vigorously. Add chilled tomato juice, along with lemon, pineapple and orange juices, then stir well. Seal well, covering with plastic wrap if needed, then refrigerate. To serve, if you’d like to rim your pint glasses or tall tumblers, pour some Tajín onto a small plate and rub each glass’s rim with a lemon wedge. Gently dip and roll each glass rim in Tajín to coat. Stir the mixture well. Fill prepared glasses with ice and add 1 to 2 tablespoons of Guinness to each glass. 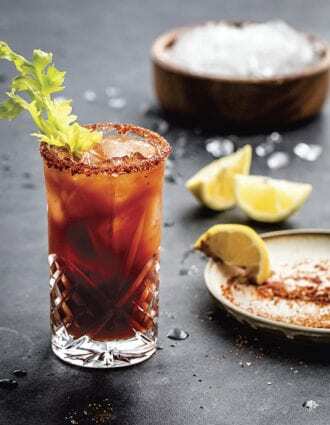 Top with the Bloody Mary mixture, stir gently, then garnish each glass with a celery stalk, lemon wedge and grated horseradish. The classic Margarita gets a savory twist with the addition of fresh-pressed celery juice and a pinch of salt.